In an effort to fight student hunger among the campus community, the UMass Lowell Navigators club has designed and facilitated a campus food pantry open to all members of the UMass Lowell community. What started as a small food drive in a crowded closet space at the mailroom of Fox Hall has expanded into a university wide, yearlong collection of non-perishable food, hygiene products and toiletries serving around 200 students this past semester. The pantry’s office, located in University Crossing room 104, is open Monday through Friday from 3 p.m. to 7 p.m. for pickups or donations. Members of the Navigators club are even willing to meet with students by appointment should the hours of operation not fit their schedule. Any member of the UMass Lowell community is welcome to join the Navigators’ effort by donating their non-perishable food items, utensils, toiletries and hygiene products to either the pantry or one of the food drive sites around campus. The idea of the food pantry started three years ago, when the Navigators club, an organization of students and faculty members committed to developing resources and connections to provide support for less traditionally abled students, noticed that many of the students they were interacting with were struggling to buy both books and food. The club faced many limitations in the early stages of its development including space, budgeting and restrictive hours, but they managed to create a food pantry that serves as vital resource for many homeless and food insecure students on campus. 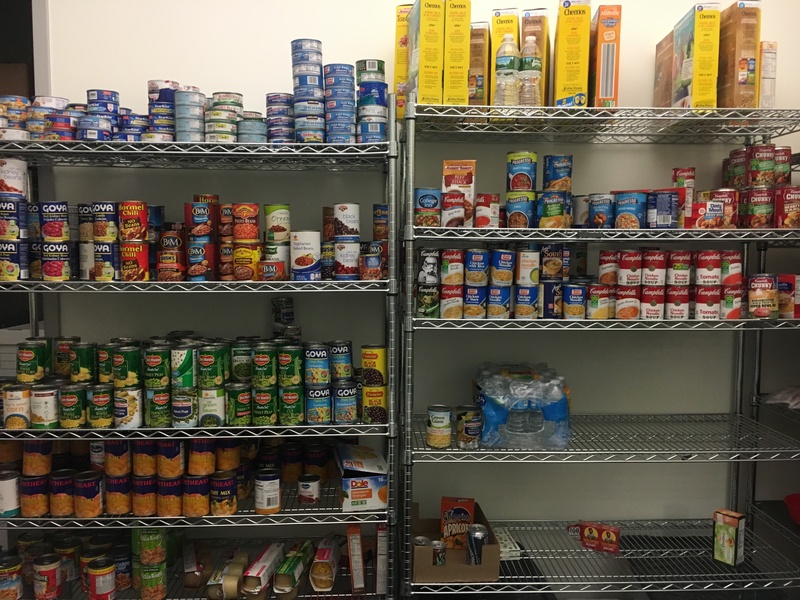 Since its recent expansion, the Navigators club’s parent organization, The Office of Student Affairs, has taken the responsibility of the pantry. They have been creating more consistent hours of operation, a better supply of products and better visibility on campus. “Food insecurity and homelessness is a growing epidemic that affects around 35 percent of college students in the United States and upwards of 4,900 students right here at UMass Lowell,” said Annie Ciaraldi of the Office of Student Affairs, who was able to have the pantry moved to a more practical and convenient space in University Crossing. As an organization, the Navigators club supports students who have been or are in foster care, are members of the LGBTQ community, transfer students, international students and first generation college students. “We really do have a lot of unique students and I think it’s important to serve them and their families” said Nadile. In order to help keep the pantry stocked with necessary items, the UMass Lowell Neighborhood Food Project was created by UMass Lowell’s Office of Human Resources. Under this food project, the campus was divided into neighborhoods to separately collect specific resources from all areas of campus. “The donations have been phenomenal since Human Resources created the Neighborhood Food Project,” said Ciaraldi. Fifteen campus buildings including the Lydon Library, O’Leary Library, the Tsongas Center and Riverview Suites currently have food drive locations from which donations are picked up and transported to the pantry. This allows the pantry to request certain items from each neighborhood and provide a consistent variety of items for the pantry. The members of Navigators Club and the Office of Student Affairs are already noticing the effects of the pantry’s presence. “You see a lot of students giving back to the pantry once they’re back on their feet,” said Nadile, explaining how many volunteers and donors are individuals who have been helped either by this or another food pantry.